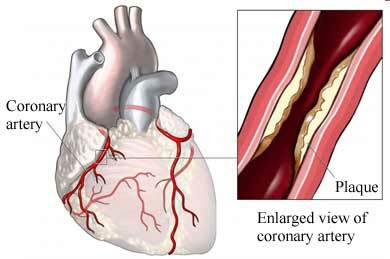 Acute coronary syndrome (ACS) is a set of features related to poor blood flow to the heart muscle that leads to a heart attack . This results in angina . ACS is a serious, life-threatening condition. If you think you have ACS, seek emergency medical treatment. The narrowing most often happens from years of plaque buildup in an artery. This is called atherosclerosis . Blood clots may often cause the narrowing arteries. Acute coronary syndromes. EBSCO DynaMed Plus website. Available at: http://www.dynamed.com/topics/dmp~AN~T116779/Acute-coronary-syndromes . Updated August 22, 2017. Accessed September 15, 2017. Revascularization for acute coronary syndromes. EBSCO DynaMed Plus website. Available at: http://www.dynamed.com/topics/dmp~AN~T115089/Revascularization-for-acute-coronary-syndromes . Updated Accessed December 7, 2016. September 15, 2017.